I've known for a while that in the thick, expansive woods behind our house lived a rafter, or flock, of turkeys. Don’t have an accurate count, but there are a few. We've seen them journey on their path many times, with just small glimpses of their silhouettes as they are confidently but cautiously crossing the back woods. I’ve also known since last week that at least one of these turkeys has a little gang, all their own, comprised of about 8-10 little chicks. Having seen them cross the street up the hill last week, I was surprised, and my anticipation grew hoping that one day they would cross over my yard since we seem to be in their migration path. Well, today was that day. I literally had a thought that it would be really amazing to see them walk through the back yard.  So real was the thought that I readied my camera, left it on the bar in the kitchen, and proceeded to get my work done. This was all at 5:30 this morning. Only about 5-10 minutes later, walking past the back French door, which I had previously left open with only the screen closed, I saw a tall turkey walking out of the woods. Reached over, picked up my camera and thought about taking pics as it crossed the yard. As I moved to the door, immediately I saw the little gang of chicks following along. Omg…this was my earlier thought coming true. Sending up a little prayer of thanks, I proceeded to focus the camera to get the shot. Instead, the crazy screen door was interfering with the auto-focus because it was water logged from the storm last night. 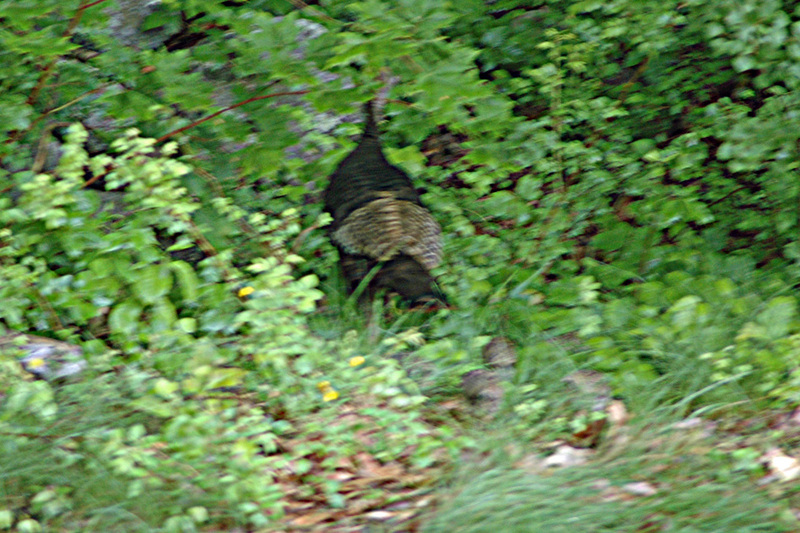 So, being the stealthy person I am, I carefully and quietly slid open the door, took a couple of shots, only to be disappointed because the mother turkey was well aware of my presence and scurried with her little ones back into the woods. This was so not fair. My one moment came and went, with nothing more than out of focus, not very well composed pics to prove it. Deep regret set in, while thinking to myself that I should have been more patient. I could have seen them farther into the yard with more sun, a better angle and more time to get some good shots. What was the hurry?? So, putting the camera back on the bar, I thought my picture taking adventure was over. I then turned around to face the door, only to see a small fox come across the yard. Wow….another big opportunity!! Yes! I can redeem myself here totally, get some great shots of nature and feel like I’ve accomplished something creative. This was all before 6am. I clearly needed to slow down. Burning out before noon was not an option. The fox, however, wasn’t there for a photo shoot. He was on the hunt. He came to the exact location the little group of chicks had wandered around in, put his nose to the ground and ran in circles until he could pick up the trail back into the woods. Now, a couple things went through my mind. The fox was going to eat the chicks! OMG…I need to stop this. My second thought was if I hadn’t frightened the chicks back into the woods, I might have witnessed the fox attacking them in my yard. That would equally not be fair! It would have been a bad start to the morning if I had seen that. 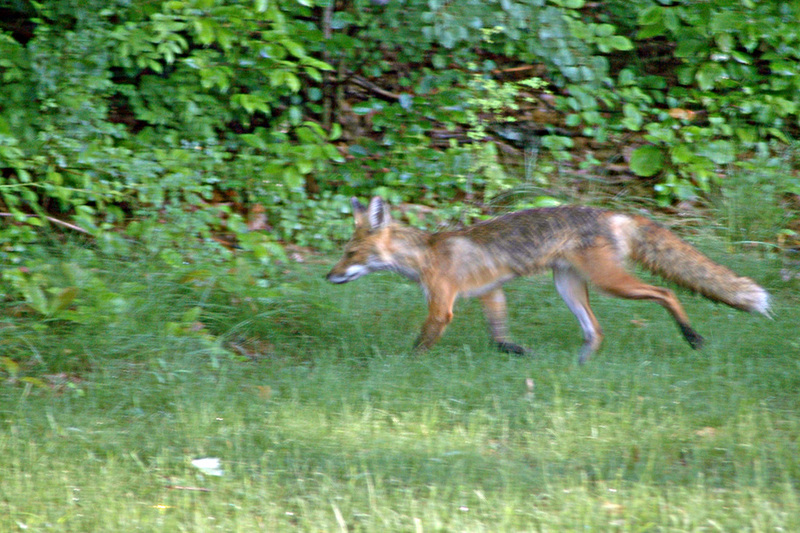 Instead, I saw the fox trot off into the woods looking for the turkey chicks and there was nothing I could do. Well, yes, there was something. 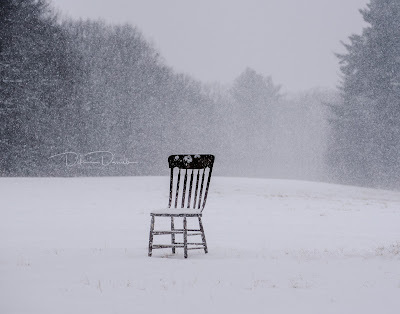 Still in my pajamas, I grabbed a coat, my shoes and my camera and turned to head off into the woods. Before I could get out the door, I heard a commotion in the woods, obviously the fox found the turkey and her babies, but I mostly heard the turkey making really loud noises. I assumed this was to scare off the predator and protect the little ones. Not sure of the real outcome, but I was hot on the trail of this live event, happening right in our back woods. So, entering the woods I see nothing. No fox, not a single turkey. 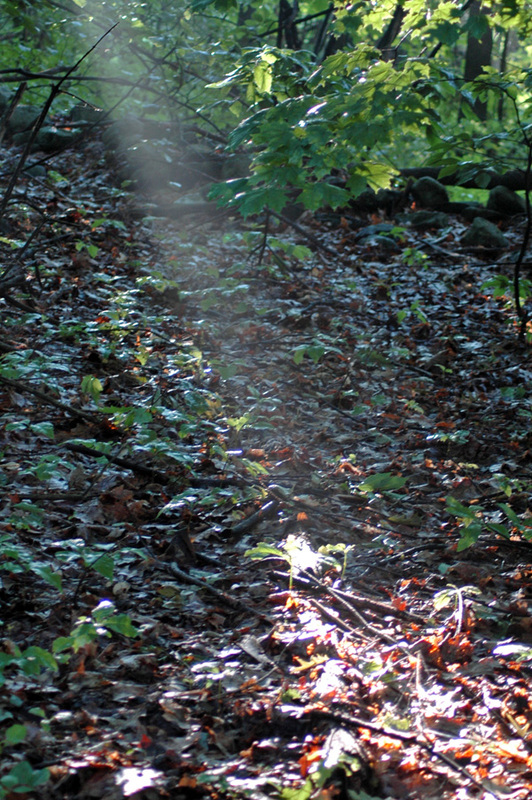 I did see the sunbeam shining through the trees like a spotlight. How beautiful. The objects it illuminated stood out as if framed by the dark shadows around it. I hadn’t been in the woods this early in the morning since we moved here. Clearly I was missing some silent beauty. 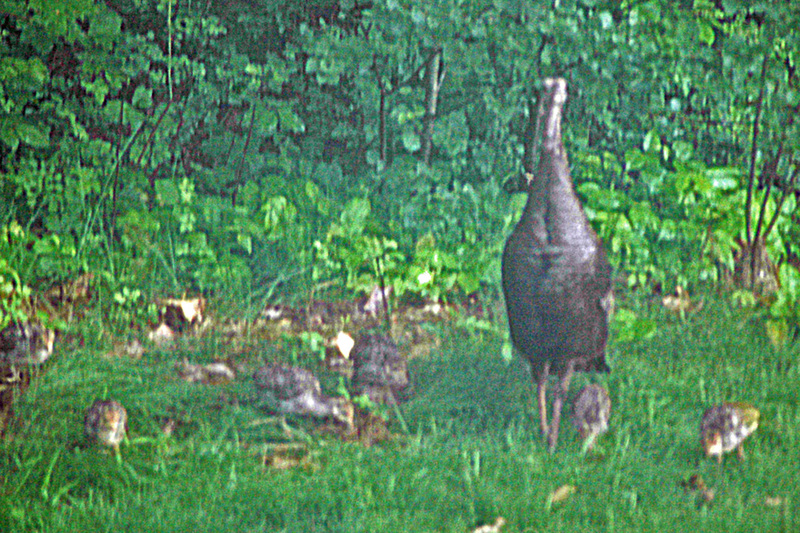 Walking farther along the edge of the woods, I heard the protective chirping of the momma turkey. At first she was hidden in the low brush that fills the woods. Then all of a sudden she took off up into the trees. The expansive wings flapping startled me and I was shocked to see this turkey actually climbing the tree by flying higher up along the branches. Where were the little chicks?? Certainly they didn’t follow her. No, no they didn’t. I was assuming she left them in a safe place on the ground and was drawing me away from them. The closer I got to the trees where she perched, the farther from the edge of the woods she flew. 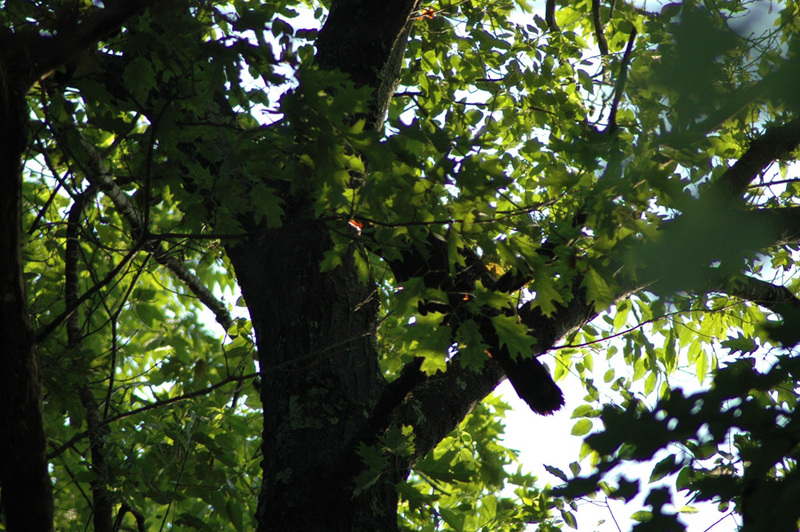 It was a very strange scenario to say the least, seeing a turkey up in the trees. I never did see the fox again, never saw the chicks again, didn’t hear even a peep from them. I have a feeling though that I will see them again since they were quite small. Surely they’ll pass through a number of times before going on their way. 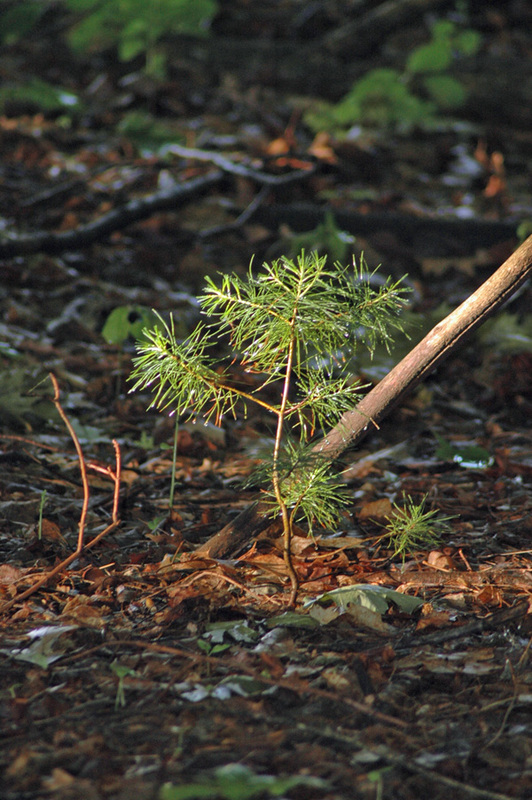 Turning to walk back out of the woods, I caught a glimpse of a tiny pine tree shining in the light. It was so cute; so little. It seemed to be supported by a branch that had fallen sometime earlier. Snapping a few last minute pics, I ended the photo journey for this morning. I did learn some things though. One, be patient while photographing nature or anything in it. It’s not going anywhere, unless you frighten it away. Clearly I need to work on my “stealthi-ness” skills. Two, nature is going to do what it’s going to do. It’s not to any advantage that I try to change that. I didn’t want to see the little chicks get eaten, and I’m not sure if any did, but I can’t guard them all day. Three, even through the disappointment of not taking advantage of the original opportunity to shoot (with the camera) the flock of turkeys, I realized that beyond that moment was another one. That’s when the fox entered unexpectedly. Till today, I didn’t know they ran through the woods. 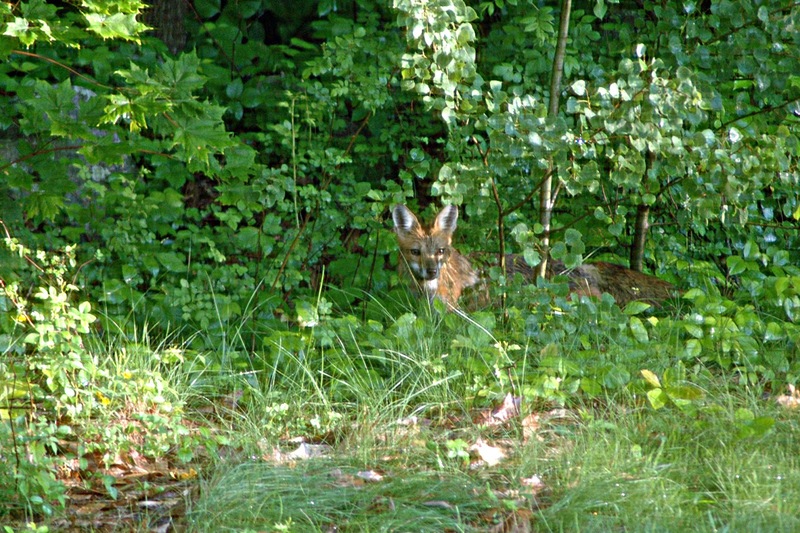 Now my awareness is awakened and I can add a fox to the list of guests in our yard. It also makes me realize that I can’t leave Maxx, our 4-lb Maltese, out on the leash by himself. Otherwise he might be breakfast for the fox. And finally, that grace allowed me to be connected to nature in this segment of time that I could easily have been sleeping, taking a shower, working at my desk already, having breakfast. Instead, I enjoyed the ever so small adventure of our back woods. It was pretty cool. Oh, note to self….under no circumstances should I wander into the woods without bug repellent. The itching will be a distraction all day, or should I say, a reminder? Yeah, a reminder sounds better.